A feature of myeloproliferative neoplasia is transforming to more aggressive and malignant myeloid neoplasia, including acute myeloid leukemia. Different pathogenesis mechanisms participate in transformation, including transformation of existing potential preleukemic clones, since JAK2-mutant myeloproliferative neoplasms often transform to JAK2 wild-type acute myeloid leukemia. Here, we present an 80 year old man with a JAK2-V617F mutant primary myelofibrosis. After 10 months the disease transform into a Philadelphia chromosome positive acute myeloid leukemia, detecting the cytogenetic aberration; t(9;22)(q34;q22) encoding the rare BCR-ABL1 fusion gene; e6a2. The patient had treatment response to tyrosine kinases, illustrating the potential benefits of such approach in treating these patients subset. The case illustrates the potential of leukemic transformation to Philadelphia chromosome positive myeloid malignancies from potential existing preleukemic clones, and the awareness of such an evolution among patients with myeloproliferative neoplasms. Tyrosine kinases have potential effect also in patients presenting without chronic myeloid leukemia and with rare BCR-ABL1 fusion transcripts, and should probably be a part of the treatment approach. The Philadelphia chromosome (Ph) is a diagnostic feature for chronic myeloid leukemia (CML); Ph+ CML is identified by the genetic translocation t(9;22)(q34;q11.2) , that involve the fusion of the Abelson oncogene (ABL1) with the breakpoint cluster region (BCR) gene. The malignant transformation is hence caused by the acquisition of the fusion tyrosine kinase BCR-ABL1 in a hematopoietic stem cell, pivotal in transforming of the stem cell into a leukemic stem cell (LSC) that self-renews, proliferates, and differentiates to give rise to Ph+ acute myeloid leukemia (AML), acute lymphoblastic leukemia (ALL), or more frequently CML [2, 3]. The complete carcinogenesis of BCR-ABL1 is incompletely understood, since as many as 10% of healthy individuals may have this fusion transcript , presence of low level of BCR-ABL1 transcripts seems to increase with increasing age , and in those individuals that develop BCR-ABL1 positive CML nearly half of the patients have additional mutations frequently found in myeloid disorders . However, Ph+ AML developing after a previous Ph− myeloproliferative neoplasia (MPN) or myelodysplastic syndrome (MDS) is rarely described. In this report we describe a patient with JAK2V617F positive primary myelofibrosis (PMF) that progressed to secondary Ph+ AML with gain of the rare BCR-ABL1 fusion transcript e6a2. The patient was an 80 years old man whose previous medical record included diabetes mellitus type 2, atrial fibrillation, cerebrovascular disease, polymyalgia rheumatica and osteoporosis. His regular prescriptions included metformin, warfarin and prednisolone. He was admitted to hospital with a hematoma at his right thigh after a minor trauma. At clinical examination palpable splenomegaly at inspiration was detected. Standard peripheral blood tests revealed hemoglobin (Hgb) 10.3 g/dL (normal range 13.4–17.0), platelets > 2000 × 109/L (150–450), white blood cell count (WBC) 23× 109/L [4–11] and lactate dehydrogenase (LDH) 366 U/L (115–255). Microscopy of the peripheral blood smear revealed a leukoerythroblastic picture including nucleated erythrocytes and promyelocytes as well as myelocytes but no blasts. 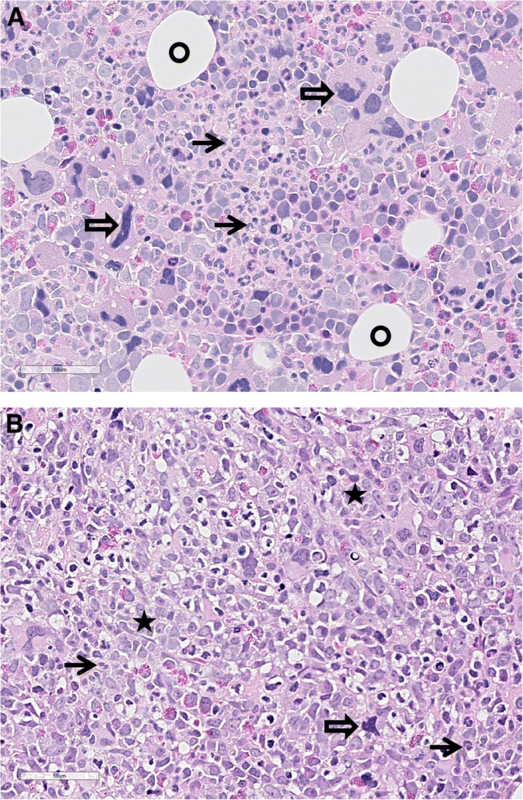 The bone marrow (BM) smear demonstrated increased cellularity with increased megakaryocytes and 4% myeloblasts; the BM biopsy confirmed this and showed in addition focal bundles of reticulin fibers and in addition proliferation of megakaryocytes with classic atypia, including small size and hypolobulation. There was reduced myelopoiesis, although without evidence of proliferation of immature cells (Fig. 1). Mutational analysis for JAK2V617F derived from peripheral blood mononuclear cell (PBMC) was positive with an allele burden of 0.6%, and a real time polymerase chain reaction (RT-qPCR) detecting the most common BCR-ABL1 fusions; e13a2/e14a2/e1a2/e19a2, was negative. Hence, our patient fulfilled all WHO major criteria for a Ph− myeloproliferative neoplasia; namely primary myelofibrosis (PMF); with (i) megakaryocytic proliferation and reticulin fibrosis, (ii) the presence of JAK2 mutation and (iii) not fulfilling the criteria for other myeloid malignancies. In addition to all the five minor criteria were also fulfilled with (i) anemia, (ii) leukocytosis, (iii) palpable splenomegaly, (iv) increased LDH and (v) leukoerythroblastosis . Cytostatic treatment with hydroxyurea was initiated at a dose of 2500 mg daily. The dose was reduced after some weeks due to severe headache. During the next 6 months the platelet count was reduced by hydroxyurea, although with difficulties in achieving satisfactory platelet counts without imposing neutropenia as a side effect. A shift of treatment to anagrelide (1 mg/day) was attempted, however had to be disrupted due to unacceptable side effects with headache, heart palpitations and back pain. Seven months after the diagnosis of PMF the routine peripheral blood smear showed an increasing blast percentage and flow-cytometric analysis verified 22% immature cells. However, a BM biopsy demonstrated only 7% blasts. The diagnosis of PMF was therefore maintained and hydroxyurea continued. Six weeks later the patient was admitted to hospital because of increasing anemia (Hgb 6.7 g/dL), leukocytosis (25.2 × 109/L) and CRP 35 mg/L. Peripheral blood smear showed 43% myeloblasts, confirmed by flow cytometric analysis. BM biopsy demonstrated a hypercellular BM without organized hematopoiesis, absence of erythropoiesis and increased myelopoiesis with relatively few mature granulocytes, focal nodes of immature cells and blast cells and significantly increased amount of reticulin fibers (Fig. 1). The findings were consistent with transformation from PMF to AML. 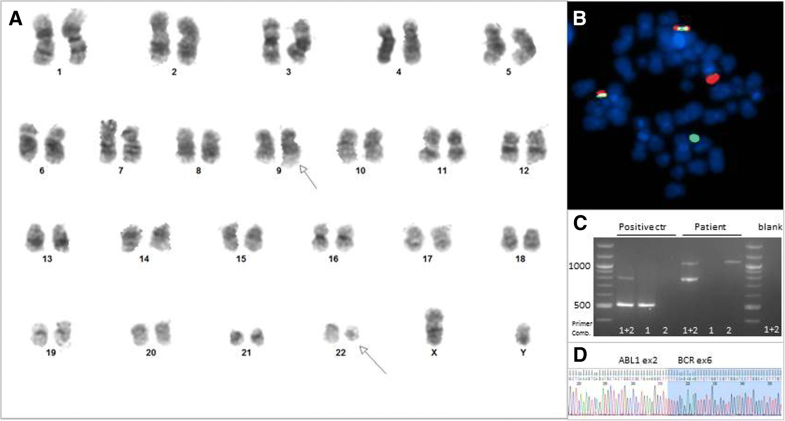 Surprisingly the cytogenetic analysis by conventional G-banding detected the Philadelphia chromosome with the translocation t(9;22)(q34;q22) in all ten metaphases analyzed. This was confirmed by BCR-ABL1 fusion in 57% of the cells by fluorescent in situ hybridization (FISH) analysis, (Fig. 2) and to be the BCR-ABL1 e6a2 transcript variant by sequencing of positive product from reverse transcriptase PCR. RT-qPCR confirmed the existence of an e6a2 BCR-ABL1 transcript, with a BCR-ABL1/GUSB ratio of 69%. Retrospectively, the e6a2 transcript was also detected at the initial diagnosis of PMF, although only with a BCR-ABL1/GUSB ratio of 14% (Fig. 3). The JAK2V617F mutation could not be detected at the point of AML diagnosis. We started treatment with dasatinib 100 mg once daily combined with hydroxyurea (500 mg/day) for the first 22 days and valproic acid (300 mg + 600 mg/day) for the first 20 days . Peripheral blood smears after 11 and 19 days showed no myeloblasts. The BCR-ABL1/GUSB ratio fell from 52 to 7.6% after 3 months (Fig. 3). Because of increasing fatigability, the patient was referred to an echocardiography that showed a pericardial effusion of 1.8 cm at the level of the right atrium. This was regarded as an adverse effect of dasatinib , and serous effusions trigged by dasatinib is suggested to be predictive for therapy efficiency in CML [10, 11]. Due to risk of recurrent pericardial effusion combined with the general condition of the patient dasatinib therapy was discontinued after a treatment period of approximately 4 months. Five days after dasatinib discontinuation, treatment with imatinib 400 mg daily was started, and a repeated echocardiography 2 weeks later demonstrated reduction in the pericardial effusion to 1.0 cm. At his last visit 2 weeks after initiating imatinib the patient reported that he had gradually improved. He experienced two episodes of diarrhea, but no other side effects of imatinib. 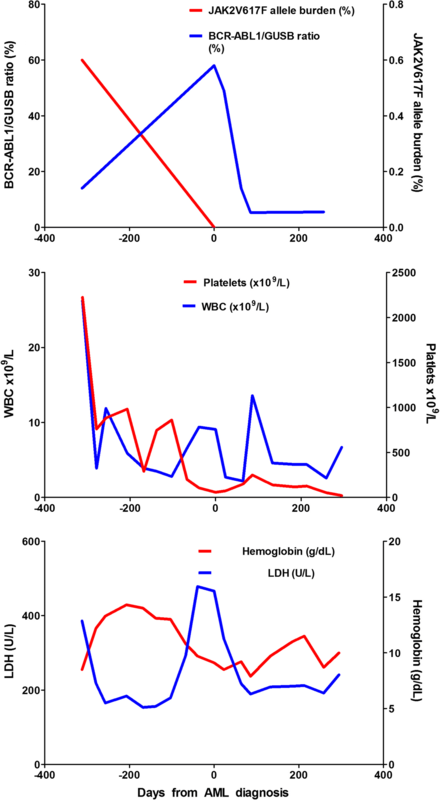 Peripheral blood test showed Hgb 11.5 g/dL, WBC 5.3 × 109/L, neutrophils 2.8 × 109/L, and platelets 161 × 109/L. He continued imatinib therapy for 6 months and had detectable although stable levels of BCR-ABL1/GUSB ratio measured by qPCR during this period (Fig. 3). Thereafter the patient developed increasing abdominal pain and diarrhea. A CT scan demonstrated a tumor in the pancreatic head, radiological consistent with adenocarcinoma. The patient was considered inoperable and unable to tolerate chemotherapy, and the tumor was not biopsied. He continued the imatininb treatment for an additional period of few weeks and died shortly thereafter. Myeloproliferative neoplasms (MPNs) comprise a group of clonal stem cell disorders characterized by a high prevalence of mutations in one of the three genes JAK2, CALR or MPL , overproduction of mature blood cells, and variable rates of transformation to AML . MPN comprise a wider spectrum of mutations, and the combination of mutations seems to predict progression rate to more aggressive myeloid neoplasms like AML . Our patient was initially diagnosed with PMF, as he fulfilled all the major and minor diagnostic criteria as stated by the WHO guidelines . He received cytoreductive treatment for lowering of the platelets count . Accordingly, his platelet counts fell, and he had no sign of thrombotic disease. The risk of transformation to more aggressive myeloid malignancies should always be kept in mind during follow up of for MPN patients. Older age by itself seems to be the main independent risk factor for transformation , although genotoxic therapy also seems to increase the risk . The risk is higher for patients with PMF than for patients diagnosed with polycythemia vera (PV) and essential thrombocytosis (ET). Our patient developed increasing thrombocytopenia and raising WBC counts during follow up (Fig. 3), and a blood smear demonstrated an increasing blasts count. Development of AML was therefore suspected and verified by bone marrow examination showing a blast count > 20%  (Fig. 1). Hence, the patient fulfilled the criteria for secondary AML (s-AML). Surprisingly, the karyotyping demonstrated the presence of a Ph chromosome, confirmed by FISH analysis. Hence the myeloid malignancy was classified as Ph+. The Ph chromosome is a hallmark for CML, where > 97% of the patients present this translocation. However, it is believed that a low fraction (~ 1%) of AML patients also has this features . Consequently, this is defined as an own entity with prognostic impact in the new recommendations from European Leukemia NET . Although, the distinction between CML in blast phase and AML or bi-lineage acute leukemia (BI-AL) is not straightforward. Patients with Ph+ AML seem to have distinct morphological, clinical and genetical features distinguishing them from CML in blast phase [19, 20], while immunophenotypic features distinguish Ph+ AML from Ph + ALL and Ph + BI-AL. In contrast to CML in blast phase, in which the disease mandatory harbors a BCR-ABL1 fusion, AML transformation following a JAK2V617F-positive MPN commonly lacks the JAK2V617F mutation and thus presents with a JAK2 wild-type leukemia [21, 22]. This was also the case in our patient, as the JAK2V617F mutation detected at diagnosis of PMF was no longer detected at the diagnosis of AML. Contrariwise, the BCR-ABL1 e6a2 fusion gene detected at the diagnosis of AML was only detected retrospectively, and thus represents a minor cell subset at the time of PMF diagnosis. Taken together, these results indicate that the BCR-ABL1 positive AML clone arose from a JAK2 wild type cells and not from the clone giving rice to the initial PMF. The JAK2V617F mutation allelic burden was low at the time of diagnosis, however low allelic mutation burden are not uncommon in PMF [23–25], in fact low JAK2V617F allele burden in PMF is associated with a more aggressive disease and poor overall survival [23, 24]. It has been postulated that an overriding JAK2V617F-negative clone conferring a more aggressive disease phenotype could be present [23–26], and for our patient we retrospectively detected this clone as being Ph+. Our patient presented with the very rare BCR-ABL1 transcript e6a2 that has been reported only for a few patients, and we have summarized these findings in Table 1. To the best of our knowledge this is the first report of this rare transcript arising in a previously JAK2V617F mutated patients. Clinically, CML cells with this variant e6a2 BCR-ABL1 fusion transcript, often present in advanced stage with an aggressive disease, including presentation in blast phase and with AML. However, occasionally good responses to TKI have also been documented, a rare phenomenon reported in the case of Ph+ AML. For our patient, first dasatinib and later imatinib, resulted in considerable reduction of the BCR-ABL1 transcript (Fig. 3). There is no evidence to support the preference for one TKI in Ph+ AML , although given the broader spectrum of kinase inhibition with dasatinib compared to other TKIs, some authors suggest dasatinib to be the TKI of choice . Our patient developed a tumor in the pancreatic head. The tumor was not biopsied as the patient was considered unable to tolerate chemotherapy or surgery, and the diagnosis of pancreatic tumor was based on findings by CT scan, and considered radiological consistent with adenocarcinoma. Autopsy was not performed, so we can for sure not rule out a myeloid sarcoma as an uncommon manifestation of AML, although this seem unlikely. Interestingly, patient with MPNs probably have a modest, although significant, increased risk of secondary malignancies , as also detected in the present patient. To the best of our knowledge this is the first report of a secondary Ph+ AML arising from previously JAK2 mutated MPN. The very rare BCR-ABL1 transcript e6a2 was detected in the transformed AML cells, and this transcript is associated with an aggressive phenotype. The AML arouse possibly from a more resistant but less robust primitive ancestral clone. The case illustrates the importance of new genetic evaluation also in s-AML since TKIs can be a treatment approach for such patients. We appreciate the collaboration and technical support from staff from the University of Bergen, Haukealnd University Hospital and the University Hospital of Northern Norway. The study received support from The University of Bergen and Helse Vest and The Norwegian Cancer Society. MKB, KL and HR were the primary contributors in writing the manuscript. MKB, RH, FL and HR created the illustrations. KL, ØB, BTG and HR contributed to patient care. RH, IJL and MV interpreted and analyzed the patient data and genetic tests. FL analyzed and interpreted the histological examination. RH, FL, ØB and BTG critically revised the first version. HR initiated and coordinated the work. All authors read and approved the final manuscript. Sampling for bio banking was approved by the local Ethics Committee (Region III, University of Bergen, Norway) and sample collected after written informed consent. Written informed consent for research and publication from the patients was obtained.